Three Generations of Dry Cleaning Excellence Since 1905! Ambassador Laundries, Inc. has been providing complete laundry and dry-cleaning services in Athens, OH since 1946. Stop in for expert alterations, quality dry cleaning and convenient rentals. We take care of all your laundry needs on site and offer next day service at no extra charge! Ambassador Laundries, Inc. is more than just a laundromat in Athens, OH. We are your full-service laundry professionals. Our services include everything you need for clean, fresh clothing and linens. We offer on-site alterations, dry cleaning, tailoring services, linen rental, uniform rental, and coin-operated laundry machines. Our knowledgeable team also repairs broken buttons and zippers and does patching. We take all clothing items, bedding and draperies. This complete line of services has made us the leading laundromat in Athens, OH. Our customers know they can count on us to deliver superior service and impeccable results, every time. Ambassador Laundries, Inc. is proud to have served the residents of Athens since 1946! As a long-standing member of this great community, we enjoy an A+ rating with the Central Ohio Better Business Bureau (BBB). We are also members of the Athens Area Chamber of Commerce and the Drycleaning and Laundry Institute. Our established industry reputation is built on integrity, reliability and excellence in service. We invite you to stop in and start taking advantage of our many service benefits. From fresh linens to expert dry cleaning in Athens, OH, we look forward to meeting all your laundry needs. We offer next-day service at no extra charge. We are locally-owned and -operated. Established in 1946, we bring extensive experience to every order. We offer a full range of services, from dry cleaning to tailoring and alterations. We hold an A+ rating with the Better Business Bureau (BBB). For a new type of laundry experience, see the experts at Ambassador Laundries, Inc. with all your dry-cleaning, laundromat, rental and clothing-repair needs. February 2, 2018 Bryce C.
"Needed uniform alterations done quick. Uniforms were delayed a few months and inspection was just around the corner and they got my uniforms..."
November 24, 2017 Joseph K.
"Always reliable and the stuff is ready when they say it is"
October 5, 2017 Reif H.
"I had some suit jackets that didn't fit me anymore and needed taken in. 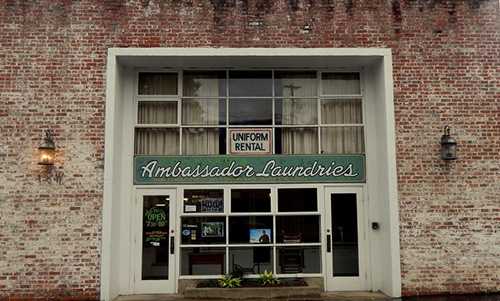 Ambassador Laundry took great care of my coats and were extremely ec..."
July 21, 2017 Joshua C.
February 5, 2017 Hind R.
"Dry cleaning here is much more convenient and officiant than the one across the street -good laundry"